This morning I heard the sad news. Actor Len Lesser died yesterday. Although he had a long & varied career, I remember Lesser best as Jerry’s Uncle Leo on Seinfeld. My older daughter is addicted to the show, watching reruns over and over and over via our big refrigerator box set. So almost daily Uncle Leo graces our TV screen, whether stealing books or looking “angry” with drawn-on eyebrows. Since I was planning on making a recipe from my freecycle score today anyway, I decided to shelve the pot roast and curried chicken & rice I’d been contemplating and make Mulligatawny Soup instead. 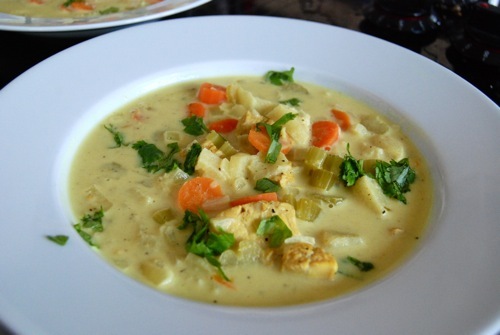 One of the famous recipes from the Seinfeld episode The Soup Nazi, Mulligatawny Soup is a delicious combination of tart apple, chicken & veg in an ultra rich, creamy curry broth. The choice seemed fitting. Though Uncle Leo never faced off with the Soup Nazi on the show, I just know if he had, he would have won. RIP, Len Lesser. You will be missed. Recipe adapted from One Dish Meals The Easy Way. 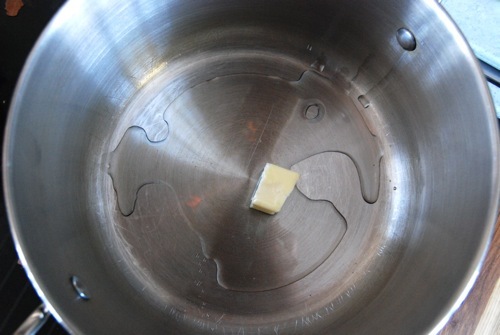 In a medium stockpot, melt the butter in the oil over medium-high heat. 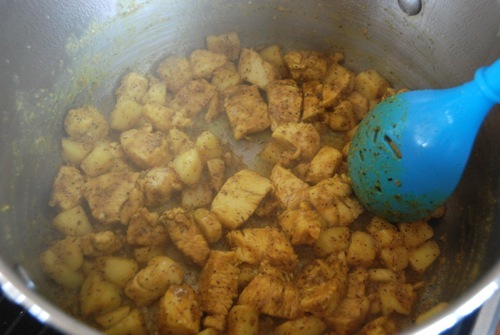 Add the cubed chicken, apple and curry powder and cook, stirring, 5 minutes. 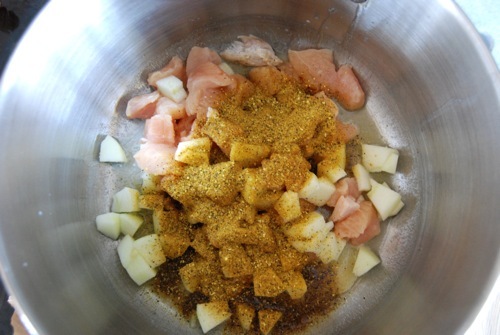 Add the broth, carrot, celery, onion and freshly ground black pepper to taste. Cover and bring to a boil. Reduce heat to low and simmer 20 minutes. Just before the cooking time is over, whisk the cream with the cornstarch and lemon zest. 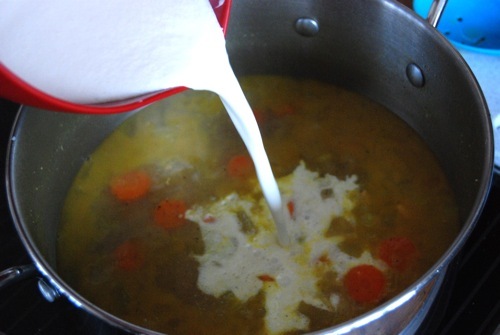 At the end of the 20 minutes, pour the cream mixture into the soup. 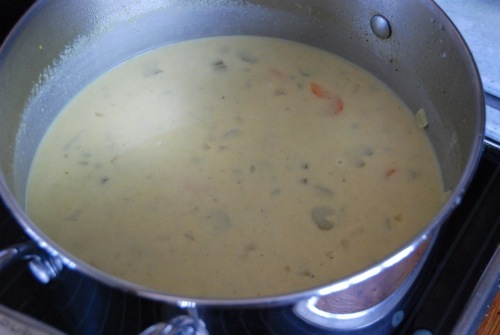 Cook, stirring constantly, until the soup returns to a simmer and thickens, just a few minutes more. Remove from heat and serve immediately, garnished with the chopped fresh cilantro. 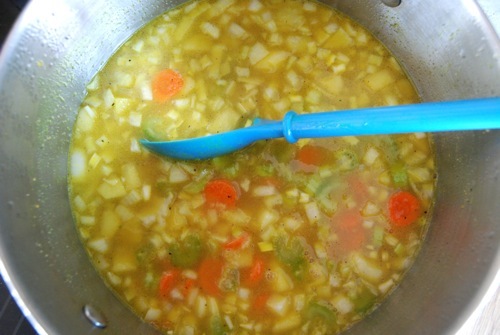 NOTE: When making this soup, I substituted 2T. Sunny Singapore Salt Free Seasoning from The Spice House for the curry powder, black pepper & lemon zest and it was AMAZING!!!!!! If you haven’t tried this seasoning, or any of the other salt free blends from The Spice House, you really should. This entry was posted in Soup and tagged Len Lesser, Seinfeld, Soup Nazi, Uncle Leo. Bookmark the permalink. Wow, wow, I was really excited there for a second when I thought you had a TV made out of an old refrigerator. Still, it’s a lovely soup! Now I get it – you thought we had a TV made out of a fridge! 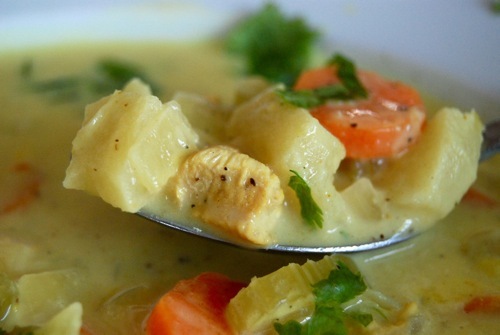 Had to go back and read… Glad you like the look of the soup — it is SO GOOD it’s almost gone! Stumbled on your blog while I was reading the forums and I came across this post on Mulligatawny soup and it brought back a lot of memories. When I was in 9th grade, my friend’s father took us out to an expensive restaurant in Bangalore, India and we ordered Mulligatawny soup and some starter. We had never heard of this soup before and thought it would be some exotic thing. We were shocked when we saw our soup bowls and realized that it was pepper-rasam (as it is called in India). Then after some linguistic gymnastics – we realized that “Mulliga…” is actually an Anglicized version of “melegu” or pepper in Tamil (a South Indian language). We were charged for drinking something my mother used to make when I had throat ache !!! “HELLOO!” Oh no, I loved Uncle Leo! I’m so sorry to hear he has passed on. Soup looks fab! Picking up granny smiths and curry powder on my next grocery run. Did you make it in your dutch oven? Hey Krishna! Interesting how that restaurant figured out a way of making you pay dearly for what’s otherwise a home remedy! Too funny. I’m not surprised this soup looks nothing like the original. I’d love to see the “real deal” – better yet, taste it! Hope you enjoy it anyway – we sure did. Thanks so much for the lovely compliment about my photos. Each day is another practice session..
Hey Tammy! I was sad too. We ate a “special dinner” tonight in front of the TV watching The Package episode of Seinfeld. Hope you too enjoy the soup. I couldn’t make it in the dutch oven (too small) – had to use a stockpot instead. I updated my Stuff I’d Like to Have page to reflect the acquisition, but now I’m thinking GEE.. I wonder if someone else would send me a BIGGER one?? Greedy, aren’t I?! I am impressed you tried the soup to begin with!! With a name like Mulligatawny, that’s an accomplishment – and to have found it appealing enough to buy a quart for home consumption. WOWZA. Try not to think of it as a fail, but rather a WIN. Even though the reheated curry left you running, perhaps another “first try” isn’t too far off?